Bunker firm recognised by the Dubai Multi Commodities Centre (DMCC) for its compliance approach. Bunker firm Monjasa has been recognised by the Dubai Multi Commodities Centre (DMCC) for its approach to compliance by winning the 'Best Compliance Award' at the DMCC Member Awards 2018, held in Dubai on April 30. 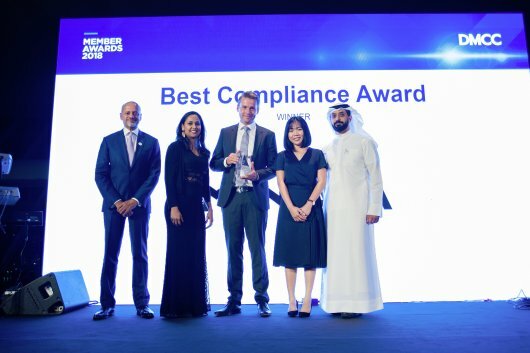 Monjasa's Compliance Assistant, Meg Barcellano, and Group CEO Anders Ostergaard were handed the award at the event, which took place at FIVE Palm Jumeirah, located on the tree-shaped Palm Jumeirah island. According to the organisers, "this award is to recognise a company which has sound compliance and corporate governance framework and implemented the highest standards of ethical conduct, due diligence, and best practices within the organization." "We take this as encouragement to keep this up and to continue living our values when it comes to compliance," Monjasa said. DMCC is a government entity established in 2002 to enhance commodity trade flows through Dubai. The Free Zone comprises more than 15,000 businesses in Dubai. Back in March, in a series of interview articles published by Bunker Index, COO Svend Stenberg Molholt outlined Monjasa's global approach to compliance; he also reflected on the increased scrutiny from clients, banks and regulators; and explained how the use of questionnaires in its procedures now forms a key part of how the company works with suppliers and customers as it continues to look at ways of improving quality and compliance.